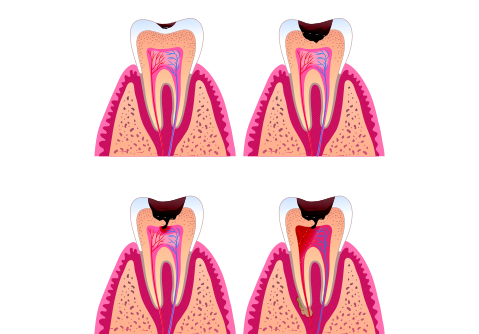 Root canal therapy is an economical way of restoring an infected tooth. Abscessed teeth can be resolved by this treatment. It is much less costly to save an existing tooth through root canal therapy than to replace the tooth by other means such as an implant after extraction of the tooth. Although most people assume or have heard that root canals are painful, typically most patients do not experience discomfort. The procedure can be compared to a filling for the root portion of the tooth. The procedure consists of numbing the tooth, creating a small opening and removing the pulp tissue in the center of the tooth /root. The center of the tooth is replaced with a resilient filling material. This material acts to seal off the canal and prevent further infection from occurring. The small hole is then sealed off with a filling on top of the tooth. After root canal therapy, teeth are weakened and become more brittle. As a result, a crown is considered the standard of care to prevent a future fracture of the tooth.